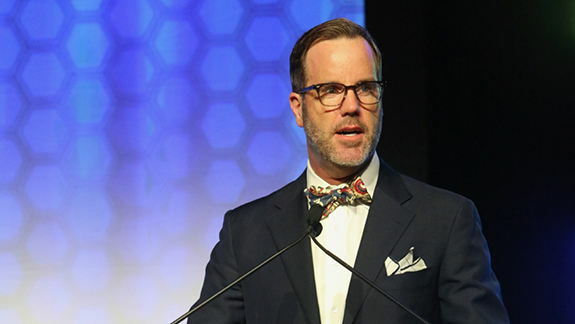 Aug. 30, 2018 - Tom Durein, Oregon State '92, was elected as Delta Upsilon's 42nd International Fraternity President during the Assembly of Trustees at the 2018 Leadership Institute on July 28, 2018. Tom succeeds E. Bruce McKinney, Missouri '74, who retired from the Board of Directors after 13 years of service and four years as President. Tom joined the Delta Upsilon Board of Directors 2015 and served as an Alumni Director until his election as President. However, this was not his first service as a part of Delta Upsilon leadership. He served on the DU Educational Foundation's Board of Trustees from 1998-2015. Also, after graduating from Oregon State University, Tom went on to serve as a member of the Delta Upsilon staff as Expansion Director from 1992-1993, Director of Fraternity Services from 1993-1994, Director of Member Services from 1994-1995, and Foundation Director of Campaign Development from 2003-2006. Per the Delta Upsilon Constitution & By-laws, the Fraternity's Nominating Committee presented a slate of nominees to undergraduate and alumni chapters 60 days prior to the vote, which took place during the Assembly of Trustees at the Leadership Institute. Delta Upsilon's Board of Directors is tasked to manage DU's financial and strategic operations and directs the International Fraternity Headquarters staff to execute that strategic vision. Congratulations to Brother Durein and all those serving on Delta Upsilon's International Fraternity Board of Directors!